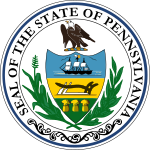 The 1800 United States presidential election in Pennsylvania took place as part of the 1800 United States presidential election. The Pennsylvania General Assembly, consisting of the State Senate and State House chose 15 representatives, or electors to the Electoral College, who voted for President and Vice President. The 1800 election marks the only time in Pennsylvania history that presidential electors were chosen by the State Legislature. 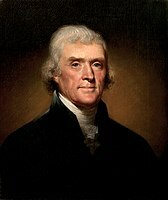 Pennsylvania elected eight electors supportive the Democratic-Republican candidate, Thomas Jefferson and seven electors supportive of the Federalist candidate, John Adams. Note: These are the vote totals for each candidate for the entire State Assembly, including the State Senate and the State House. ^ "1800 ELECTION FOR THE FOURTH TERM, 1801-1805". National Archives. Retrieved 4 August 2012. ^ a b "Pennsylvania Presidential Election Returns 1800" (PDF). Wilkes University. Retrieved 4 August 2012.